Are Light Cigarettes Safer for You? Smokers in the United States used to be able to buy cigarettes that claimed to be "ultra-light", "mild," or "light." Tobacco companies developed cigarettes that were advertised as a healthier choice than "regular" or "full-flavor" cigarettes in the 1960s and 70s, asserting they contained less tar and nicotine. Numerous studies were being published at that time that linked smoking to cancer, and this was manufacturers' response to the issue. Smokers noticed that the smoke from light cigarettes did feel smoother and lighter on the throat and chest, so it seemed true that light cigarettes must be healthier than regulars, but this was not the case. However, the idea that light cigarettes were a better smoking choice took hold and held fast for decades. What Makes a Cigarette "Light"
Machines that "smoke" cigarettes were used to obtain the tar levels for ultra-light and light cigarettes, which is a problematic way to make these measurements. Machines smoke cigarettes differently than people, so it's hard to get an accurate reading. 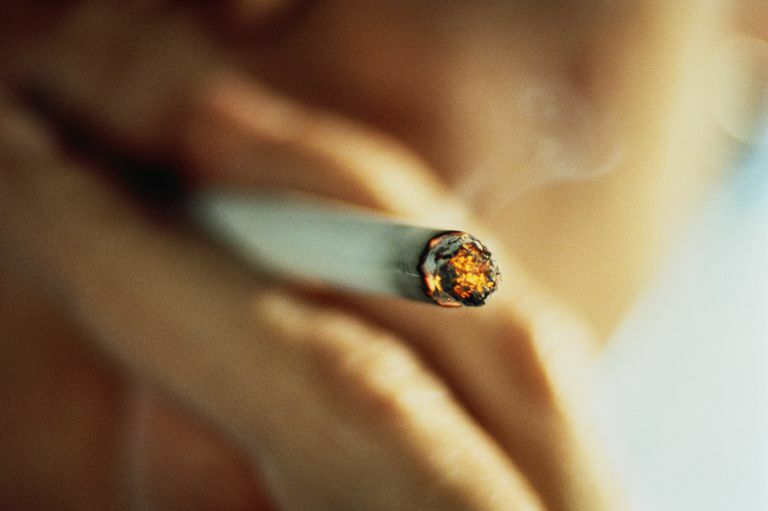 Further, no two people smoke in the same way, so tar levels can and will vary quite a bit from one smoker to the next. Machine-smoked tar yield will usually be lower than the amount of tar inhaled by a person. It is important to note that the tobacco industry itself decided on what defined "ultra-light" and "light," and not a Federal agency as you might expect. Cigarette filters made of cellulose acetate are used to trap particulate matter in cigarette smoke (tar) to keep it from going into smoker's lungs. Cellulose acetate is the white cotton-like material that makes up the interior of the filter. Filters do trap some tar, but plenty of it escapes the filter and is inhaled. It also floats in the air and is the part of cigarette smoke known as third-hand smoke. The paper used in light cigarettes is more porous than the paper used in regular cigarettes, allowing the chemicals in smoke to exit through the paper before reaching the smoker's mouth. However, the chemicals are still in the air around the smoker and, if in an enclosed space, will be inhaled as secondhand smoke. The addition of tiny, perforated holes in the cigarette filter let air be inhaled along with tobacco smoke, thus diluting the smoke. Unfortunately, many people unwittingly cover the holes with their fingers when holding the cigarette, defeating this purpose. Some smokers even deliberately cover the pinholes because the diluted smoke doesn't offer a satisfying smoking experience, and/or they take bigger puffs and smoke a few extra cigarettes per day to compensate for the lower nicotine yield. Are Light Cigarettes Still Available? The Family Smoking Prevention and Tobacco Control Act of 2009 granted the U.S. Food and Drug Administration the power to regulate tobacco products. One of the first actions taken was to limit how cigarette companies are able to describe their products. They can no longer use the terms "light," "low," or "mild" on cigarette packaging because science does not support this claim and it misleads the public. Tobacco companies are invested in casting their products in the most positive light possible, so losing the ability to brand cigarettes as light or mild was a blow. Sneakily, many have taken to color-coding cigarette packaging to trigger the "light" concept for smokers who used to buy these same brands (usually with the same colors) in the past. For example, Camel Lights are now Camel Blues, and Marlboro Ultralights are now Marlboro Silver. Elsewhere in the world, cigarettes branded as "light" are still available. A report from the National Cancer Institute (NCI) concluded that light cigarettes do not represent any benefit to a smoker's health. People who switch to light cigarettes from regular cigarettes are exposed to the same toxic chemicals and are at the same risk for the diseases related to smoking. Light cigarettes do not reduce the health risks of smoking; the only way to reduce your risk, and the risk to others around you, is to stop smoking completely. Quitting also decreases your risk of lung cancer, heart attacks, stroke, and chronic lung disease. National Cancer Institute. "Light" Cigarettes and Cancer Risk. http://www.cancer.gov/about-cancer/causes-prevention/risk/tobacco/light-cigarettes-fact-sheet Reviewed October 28, 2010. National Institutes of Health. National Library of Medicine. The Impact of Cigarette Package Design on perceptions of Risk. http://www.ncbi.nlm.nih.gov/pubmed/19636066. July 27, 2009. How Much Do You Know About the Litter That Results From Cigarettes? What Does Ammonia in Cigarettes Do? When Will the FDA Ban Menthol Cigarettes?